For the last 20 years Adnet have been successfully providing software for all aspects of the creative industry; from ad agencies, design companies and media independents through to PR consultancies, exhibition/event organisers and DM companies. Our comprehensive software provides a complete agency infrastructure, covering every aspect of agency and consultancy work from budgets and client timing plans through to time recording and financial management; you name it, we cover it (tea making facility coming soon!). 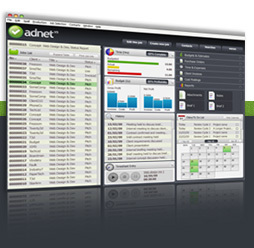 The core of this industry-leading package is Adnet v5, and whether your organisation has 2 or 2000 people, this complete integrated system can be customised to your individual requirements. Designed by creatives, for creatives, it allows you to control every step of managing your agency. We are the heartbeat of the creative world.